Now to say that my dad was a teller of tall tales would be a considerable understatement of the actual facts. He reveled in telling tales that were far-fetched, yet believable to a kid – such as his assertion to us that chocolate milk came from brown cows, or that buttermilk came from cows that liked to jump around. When I was quite young, he'd tell several of these tall tales every day. We believed those tales, for a while. What made him particularly good at these tall tales was that he'd mix in a few actual facts to them, and even occasionally tell a tall tale that was actually true. And he had one promise to us: that if we asked him if one of his tales were true, he'd tell us whether it was. I did ask him, one day, if the tale of the holly tea was true – and he said that it was, though there was some disagreement amongst historians on exactly how it was used. Fast forward to something like 35 years ago, when I decided one day to read up on this “holly tea”. 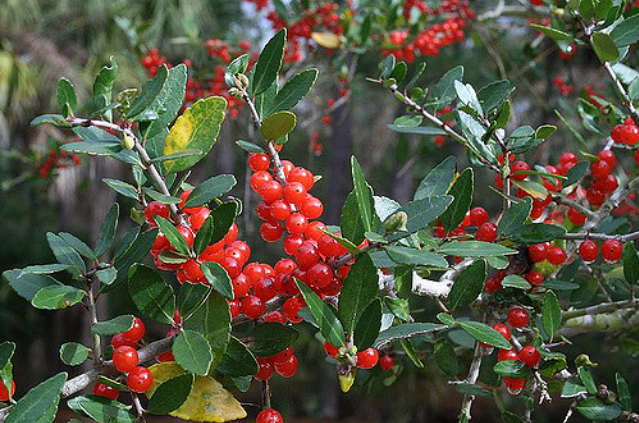 I quickly found a reference to it (this is back before the Internet, so I was in a library researching this): my dad was talking about a tea called yaupon, made from the native-to-America holly Ilex vomitoria. An article I read this morning got me looking again, this time on the Internet. I found many references online, including this one from 1917 referencing the caffeine content of the plant's leaves, and this one talking about one drink (“black drink”) made with Ilex vomitoria and other herbs that was in fact an emetic (vomit-inducer). My interest was piqued by the article I read this morning, where I learned (for the first time) that the emetic effects were not actually caused by Ilex vomitoria, but in fact by other herbs. Also interesting in that article was some speculation about how the name came about. Apparently Ilex vomitoria is relatively rich in caffeine, and is quite tasty as a tea (according to a considerable number of comments I found online). That got me to look on Amazon, and sure enough, yaupon tea is readily available! So I ordered two ounces of it to try out. I'll report back after I try it, in particular on whether it has any chance of displacing my beloved Darjeeling. One thing that occurred to me is that here is a tea that (I believe) my Mormon friends could drink without violating their health laws. A little online research tells me that is very uncertain.